This Baptismal Certificate shows the Baptism of Christ under radiance of the Holy Spirit near the top of the page. Directly below; a family presents a child in a traditional modern Baptism with the altar behind and Matthew 28, 19 & Mark 16, 16 passages flanking each side. 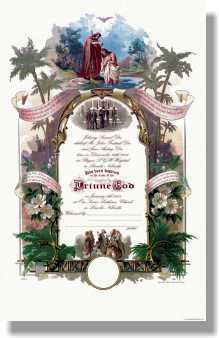 With palms, flowers and foliage down the sides, two additional passages, Mark 10, 14 & John 3, 7 stand beside the hand drawn declaration (Has been baptized in the name of the Triune God,” in the center of the page. Near the bottom of the page, a final illustration of Christ teaching the children sits atop an emblem circle, which allows individual churches to affix their own embossing. This is a beautiful example of early color lithography.